In a moment of madness I bought a body scrub. In recent weeks my legs have returned to their old self and become a flaky mess. I decided I had to face my fears and exfoliate them. In all honesty I find body scrubs painful and uncomfortable on my skin. It's important to remove dead skin cells but I feel having eczema causes delicate skin that even the most gentlest of scrubs feels like a cheese grater. You can load them with oils but it still feels like I'm attacking my body with sandpaper. In the past, I've use porridge oats to exfoliate a tip I picked up from Carrie (@NJSkinDeep). I was speaking to my Mum about using Oats on my eczema and she told me she would often give me an oat bath when I was little. I never knew she did that I thought it was a new discovery lol. Anyway, Oats are cheap and good for eczema but sometimes it's nice to splurge a little and swap the DIY scrubs for a fancy jar. I deliberated many natural brands and ended up at Aedos, a company I discovered when assisting with Stage 2 judging for the FreeFrom Skincare Awards 2013. I decided to go for the unscented version purely to eliminate any risk of irritation from essential oils. I don’t normally have problems but I figured that scrubbing can leave skin a little sensitive so I did not want to aggravate it any more than necessary. The sugar is granulated so unfortunately I do find it rough but I can grin and bear it. It does leave a layer of oil behind which I do not mind but some may find it not to their liking. If I wash down with a body puff and shower gel it can take away some of the greasiness. Before I forget to mention the scrub is suitable for Vegans. This is a nice scrub for the price (£8.50+p&p) and I can see the benefits for my skin. I have mainly been using on legs and arms because I am not brave enough to try elsewhere. I also have eczema on my chest and belly so would not use a product of this nature on those areas. 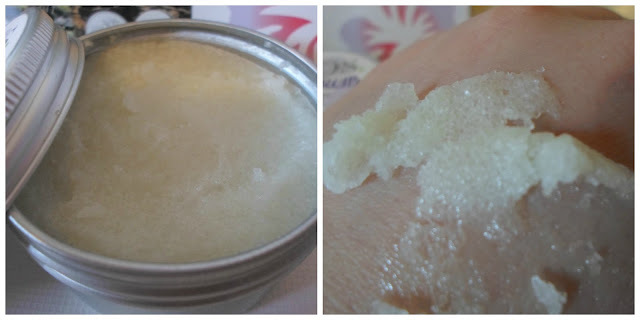 If you are someone who exfoliates regularly, then the size of the tin may be a bit small for you as I imagine a larger quantity is more cost effective. Do have a browse of the website as Aedos is a lovely natural company selling a small but perfectly formed range of handmade body and bath products. I think they will appeal to many of you. This looks lovely! Great post, I've been on the hunt for a new scrub! I love body scrubs and this sounds fab! I will have to see if they have any scented ones as I love using scented things on my body (despite it not being the best thing for the dermatitis on my hands).